The New York Power Authority (NYPA) expects to choose a contractor in the first quarter of 2018 to build the 16-MW Albany microgrid at the 98-acre Governor Nelson A. Rockefeller Empire State Plaza. The authority issued a request for proposals last year seeking a design/build team to complete permitting and interconnection requirements, procure the material and equipment, construct the facility, verify performance and operation, and operate the facility for the first 12 months. Construction is scheduled for fall and will take about 18-24 months. NYPA hopes to have the microgrid completed in 2020. The Albany microgrid will use combined heat and power (CHP) to supply 90 percent of the power, as well as heating and cooling for the 10 buildings where 11,000 state employees work. The new energy plant is expected to cut state energy costs by $2.7 million annually. 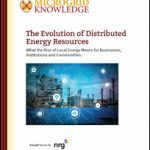 Should an extended power outage occur, the microgrid will make the plaza into an operations headquarters for the state and shelter for the community. NYPA settled on natural gas to fuel the microgrid after determining the tight urban location lacked enough space for solar photovoltaics. 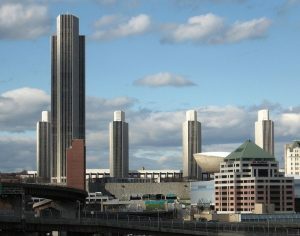 The Empire State Plaza campus is among the largest users of energy within the state-operated capital region, according to NYPA. Meeting its energy demand with solar would require about 1,000 acres for panels, along with another one to two acres for batteries. In addition, solar could not provide heat and cooling as CHP can, which adds to the facilities’ cost-effectiveness and efficiency. The site also lacked necessary space or resources for other renewables evaluated, including wind, solar thermal and geothermal. The Albany microgrid will be made up of two 7.9 MW combustion gas turbines, heat recovery steam generators with duct burners, a new emergency generator, and microgrid controls that will allow the generation resources to isolate from grid during a power outage. The system will replace aging diesel fuel-operated emergency generators and offset use of less-efficient gas boilers that now create heat for the campus. In addition to serving the Empire State Plaza, the Albany microgrid may eventually be expanded into other areas of the downtown. Learn more about urban microgrids at Microgrid 2018: Market and Models for the Greater Good. Why does NYPA continue to ignore the proposal for building Empire State Plaza as 100% renewable instead of keeping us in the cycle of fossil fuels. Fracked gas is a harm to our health, safety and democracy. We have met with NYPA to consider a geothermal proposal proposed by Jay Egg, for heating and cooling the Empire State Plaza that could be a national demonstration project in climate leadership. This is very disappointing, and we intend to fight. Very sad… Taking us BACKWARDS and deepening dependence on fossil fuels, fracked gas at that! Thank you NYS for your insistence on staying in the dark ages instead of casting light on the future for others to follow!!! So where is this “natural gas”, being acquired in a very unnatural way, coming from?? ?